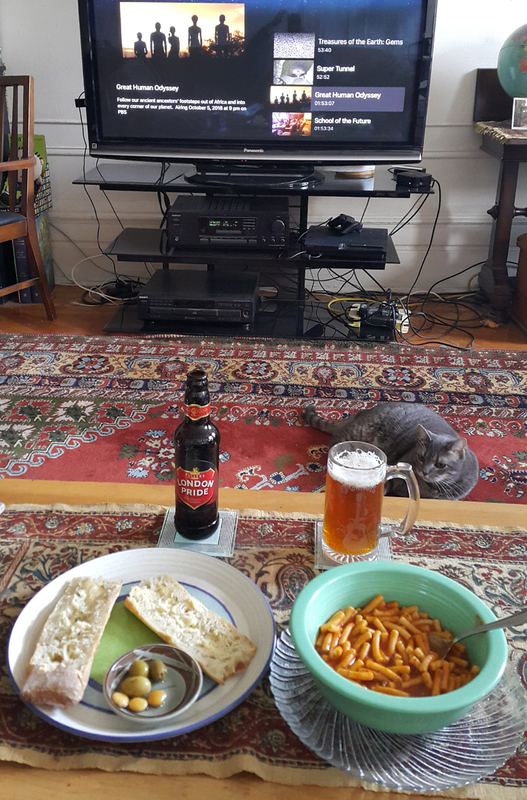 Beefaroni Birthday – Birthday Weekend Part 4. Chef Boyardee is a brand of canned pasta products. But once upon a time Chef Boyardee was the head of the kitchen at the five-star Plaza Hotel. He is personally responsible for Americans associating “Italian food” with pasta and tomato sauce, and particularly spaghetti with meatballs. Many of my earliest memories concern eatable entities, at least the fondest of them. From Play-Doh, which is rather bland, but very salty, to Funny Face, a competitor of Kool-Aid, which my mom would put in milk to trick me into drinking that calcium delivery device, I have vivid remembrances attached to many eating and drinking experiences. My dimmest memory is a view from my high chair, looking across some sort of food and out the kitchen to the front door some 40 feet away. It hovers in a corner of my mind; where it’s dark, as if it is night and all the lights are off. There is a photo of me in that very seat on my 1st birthday. But I assume the remembered event came a bit later. When it comes to “real food,” there was my mother’s chili. Years later I sought out how she had made it, and was somewhat disappointed to learn it consisted of Campbell’s tomato soup with red beans, browned hamburger and about three pieces of raw onion per person. She didn’t even add the chili powder called for by the recipe on soup can. Another favorite for me and my sister three years my junior was the macaroni and cheese made by our older sister when she would be babysitting us. Again, it proved a let down to learn it was simply boiled macaroni with a large brick of Velveeta melted throughout. As my childhood comfort food pillars toppled one by one, only one has remained steadfast and forever satisfying. 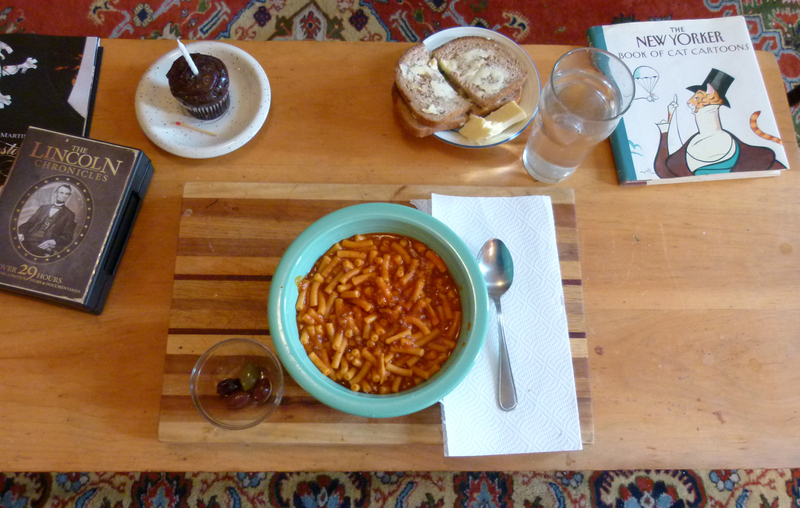 Chef Boyardee’s Beefaroni, part of this complete birthday feast. 2017’s Birthday Carbfest was just as grand. 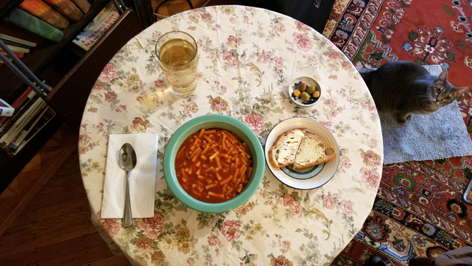 I have enjoyed Beefaroni on my birthday for years beyond count, rarely missing the opportunity, whether I have it for lunch, or supper, as we called dinner back in Ohio, or squeezing it in as a late night snack. I do not now remember when Beefaroni entered my life. But I remember clearly splitting one 15 oz can with my little sister, on many occasions, after walking home from school for lunch. Now I often have two full cans just for me. But I cannot buy the large cans, as the consistency just isn’t the same. And even with the regular cans, I have to put a good dozen of them to my ear and give them a shake to find the two with the least amount of slosh. Otherwise the sauce is too soupy. OK, these days it is always too soupy. Sigh. I was not able to find any data concerning when it was actually invented. But the chef on the can really was a chef, at the Plaza Hotel in New York City, in fact. It was the premiere hotel in the United States. And to provide some perspective, today rooms start at $825 a night. Ettore Boiardi worked in restaurants in Italy near Bologna, starting at age eight, and then followed his brother over to America in the early 1900s, where he is reputed to have worked his way up in the Plaza’s kitchen to Head Chef. He also oversaw two major dinners for President Woodrow Wilson, his second wedding, and a White House homecoming dinner for 2,000 World War I veterans. At some point he anglicized his name to Hector Boyardee, and opened a restaurant in 1926, at Woodland Avenue and East 9th Street, in Cleveland Ohio. Il Giardino d’Italia was both popular and influential in popularizing what we now think of as Italian food in America. As demand for his recipes grew, the Boyardee brothers opened a factory in Pennsylvania for their Bolognese-style dishes, which families could prepare at home. Spaghetti and meatballs soon became a national dish of America as well as Italy. During World War II, the factory made rations for the U.S. Army, and returned to normal but increased production in peacetime, retaining all of its employees. But they had an added advantage: the vacuum-sealed can, and the machinery necessary to make it thanks to the War Department. 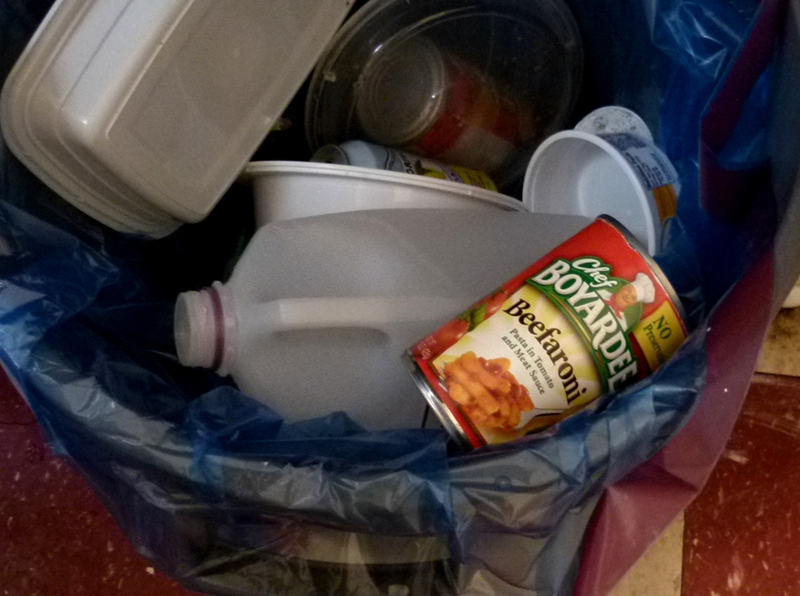 And that is how just about every canned food you can think of came into being. The company was eventually swallowed up by corporate giants, as family businesses usually are, but Chef Boyardee remained a figurehead well into the 1970s. A taste of the old country remains in Beefaroni, the humble carb and fat delivery device that remains every bit as good as it did when I was 8 years old. I never liked canned pasta products, and still don’t with one important exception. And when the ingredients consist of hamburger, macaroni and sauce, the sauce matters a great deal. It can be any brand, they all have this same fakey orange color and are far too sugary. While tis true Beefaroni has its share of sugar, or actually corn syrup these days, it has always stood apart, with a tomato sauce that actually tastes (a lot) like the genuine article. 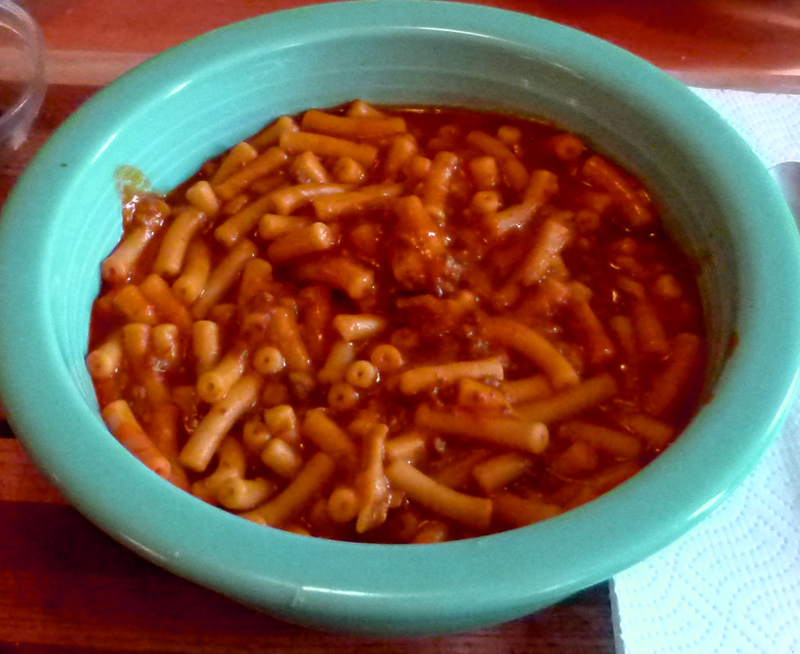 I know some of my preference for Beefaroni is related to a pleasant sense memory from my boyhood. But it really is good. And it is not all that bad for you, with less sugar than many grocery store products that claim to be healthy. Everyone has their favorite comfort foods from their childhood, and others have certain birthday foods of which they never grow tired. What are yours? I was going to get a pumpkin pie. All that vitamin A, you know. But then I thought of ginger snaps, which would go well with tea. And then I thought maybe some chocolate pudding, which I have not had in memory. But then I saw the mini red velvet cupcakes, so I got those. And the gingersnaps and the organic chocolate pudding. I only got half a pumpkin pie.